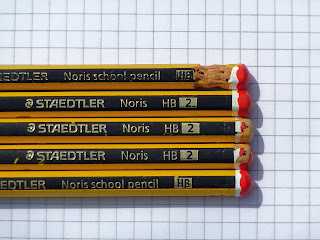 It's about time I posted about pencils again so this latest post is about the Ford Mondeo of the pencil world: the Staedtler Noris HB school pencil. 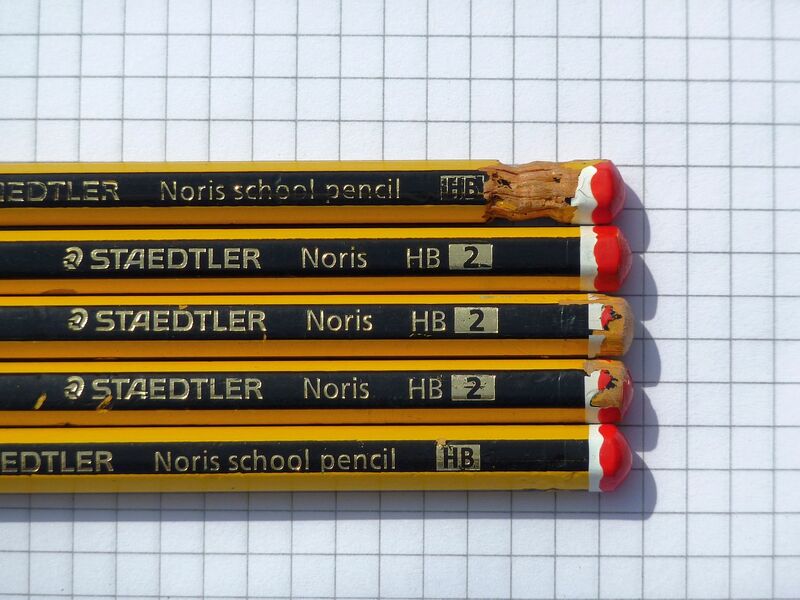 Looking around, I see the Noris being used frequently; it's probably the most common pencil in England. It helps that this pencil is cheap and widely available, often in supermarkets. It is used a lot instead of carpenters' pencils. Back in September 2010 I went to a green woodworking demonstration near my home. One of the bodgers was using a Noris to mark the wood for turning into a bowl. In addition to marking materials of all kinds, the Noris is also commonly used for jotting shopping lists or making random notes; it is commonly seen in musicians' instrument cases, for writing on their printed music parts. I suppose I should continue here with a series of sub-Proustian reminiscences about using this pencil, which has armed generations of schoolchildren here in England. The trouble is, I don't have any. I think I used Noris pencils when I was a boy growing up in west London in the 1970s and 1980s, but I have no clear memories of this. 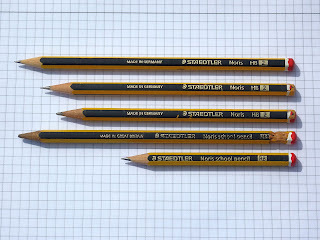 I do remember using the more up-market tradition pencils at school, but when it comes to the humble Noris there's a big blank at the centre of my schoolday memories. This could be a sign of the sheer ubiquity of this design of pencil that I have no memories of it at all: an object so common it literally faded into the woodwork. In an effort to make up for temps perdu lost time I have been using a Noris HB at work. For a child's school pencil, this is remarkably over-engineered; to be honest it's just too good to waste on children. I have a variety of made-in-Germany and made-in-GB versions here before me, many of them chewed at the end by my eldest daughter (see photo). 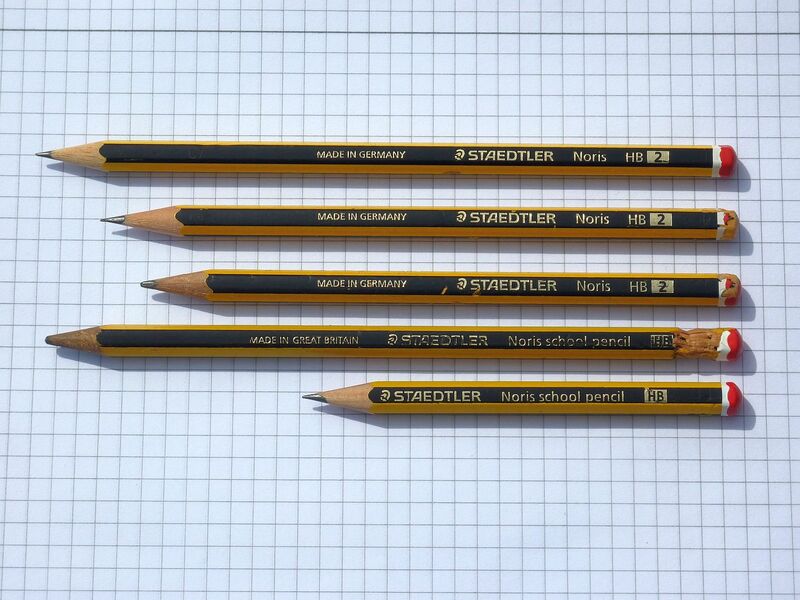 There are some variations - on some this is described as the "Noris school pencil", on others, simply, "Noris". This is a pencil aimed squarely at the lucrative educational market and is a tough, no-nonsense product. Sculpted from light, porous European wood (no cedar here) and with one of Staedtler's durable graphite lead cores, this is equipped for the rigours of the school day (namely being dropped from a desk, having the tip snapped off when drawing a circle in maths, writing a graffito in the back of an exercise book, illustrating the water cycle in the Ice Age, poking a classmate and being dropped from a desk etc). The overall appearance is as would be expected: a yellow-and-black striped pencil, topped off with a painted endcap in a variety of colours in its non-eraser tipped variant, Art. Nr. 120. The eraser-tipped version, the 122, can be found in stationers' such as Rymans, but is much less common. The Noris is manufactured in five grades: 2B, B, HB, H and 2H. In the wild, the most common sub-species sports a red endcap, this being the HB variety. I have two blister-packs of these common birds, in a multipack option offered by Staedtler in supermarkets, probably with the start of the school year in mind. Here, a pack of ten Noris HBs, bundled with a Mars eraser and a functional Staedtler sharpener, is sold in my local Tesco for the bargain price of GBP2.50. In my local stationers', the eraser alone is a quid. Tesco also offer a pack of five assorted Noris grades for GBP1.40, and a three-pack of 2Bs for a pound. All offer astoundingly good value for money. The lead is fairly dark, though not as dark as the tradition's HB. It is slightly harder than the tradition as well, probably to enable less frequent sharpening. On the paper, it leaves a slate-grey line which allows the user to vary its width. I found that I could write for a long time between sharpenings. At one point I managed to sharpen a Noris successfully with my KUM Long Point sharpener. This was good news, but turned out to be a one-off only; when I tried to use the Long Point again, I found my old problem of broken leads had returned. After three or four attempts to sharpen with the Long Point, I abandoned the idea and went back to using my standard KUM sharpener, which left me with a three-inch long stub and a pile of yellow-and-black sharpenings. The lead smears a bit on the paper, though less so than the tradition HB lead. I have not tried using any grade of Noris other than the HB, so I can't report how those perform, but the HB certainly does a fine job of writing, drawing or marking as you require. Like most fountain pen enthusiasts, I own far too much ink. I keep my ink collection in an old, wooden first aid box, the kind that would have been stationed on the wall of a warehouse or factory back in the 1980s. It's large enough to accommodate my bottles, some 20-odd strong. Looking through them, I see that I own three different brands of black ink. Why? After all, black is black, right? Well, not exactly. I bought one bottle of black ink (Diamine Onyx Black), then I bought a bottle of Noodler's Bulletproof Black, and some Pilot IC50 black cartridges for my black Capless. I am settled on the Noodler's now because of its water- etc resistance, and because it works quite well in the Capless. It is my ink of choice for those situations where I have to complete an official form. But then I bought a bottle of Sailor Jentle Grey ink. This fluid does not seem to like any of my pens, so there it sits, unused, and I haven't the gall to pour it down the sink. Mostly the inks remain unused because I initially liked the colour, but then lost enthusiasm. Diamine Imperial Purple is a case in point, here. Purple is the colour of my old university and I had the bright idea that it would be nice to write in purple ink. Imperial Purple was suggested to me by my colleagues on the Fountain Pen Network so I bought a bottle. It is a nice ink, though I have since found that it fades to a dusty purple colour. This was not what I was looking for. I have since replaced it with another purple, well actually it's called violet on the bottle: Pelikan Violett. This is also the reason why I own several bottles of blue ink (Quink, Waterman, Pelikan, Diamine, Pilot). Sometimes the inks remain unused because I love the colour but they take too long to dry because they are highly saturated. Private Reserve Plum is a good example. It is beautiful, but takes forever (seemingly) to dry on the page. As I detest smearing this is a big disadvantage. Sometimes they are unused because they don't work in my pens or I simply haven't tried them in the right pen. Pelikan Turquoise springs to mind; it's a cool colour, behaves well, and yet it's yet to find a happy home in my pens. As a colour, it's a blue which reminds me of glaciers; it's the colour of icebergs. At the moment it lives in one of my Lamy Safaris. Sometimes there are colours which I enjoy and then don't use for no particular reason. Diamine Orange is the one here. It is a genuine eye-popping orange colour, reminiscent of 1970s orange squash. I really ought to put this back into one of my pens, and soon. Some inks I buy simply because I like the bottle. I bought Caran d'Ache's Sunset for this reason, but also because it filled a gap in my colour wheel and it is one of my favourite colours. And then there are inks which I buy, try out, then forget about for a while before trying them again and wonder why I had forgotten about them. Here the winner is Diamine Woodland Green. After all the experimentation with colours I have found that green ink has the most calming effect on me of any of them. Here in England, people who write with green ink are seen as either eccentric or just barking mad, though there is also a century-old tradition of senior military and intelligence officers using it to sign documents and memos. Or are they just the same thing? When I first became enthused with fountain pens, in 2007, I bought a small bottle of Woodland Green. It was lovely, but it was probably too soon in my journey into inks to settle on it as a core colour. I soon put it away to try others. I suppose I ought to be pleased to join the green-ink brigade because writing in green ink brings me back to one of the reasons for writing with a fountain pen in the first place - to enjoy the sensation of seeing a page fill up with a beautiful colour, even if the text is as quotidian as it gets (and believe me, at work, it is). Looking again in the box I note that I own only two shades of green ink. How could this state of affairs have come to pass? My favourite colour and only two shades? Right, time to check out some J.Herbin shades. Vert Empire looks very nice though Lierre Sauvage and Vert Reseda are on the want-list too. Argh. and last but not least, an Olympia SM-3 portable (if you have a team of porters) mechanical typewriter in grey, complete with carry case. The most expensive items were the lamp and the typewriter, which both set me back a princely 3GBP. The pencils were a giveaway - ie, completely gratis and free. I am delighted with this haul, particularly the typewriter, which I have already played with. The Olympia is in full working order and the ribbon looks fine. I had gone with the intention of getting the desk lamp but as I'm always on the lookout for interesting stationery, I had hoped to find a few other bits and pieces for the collection. 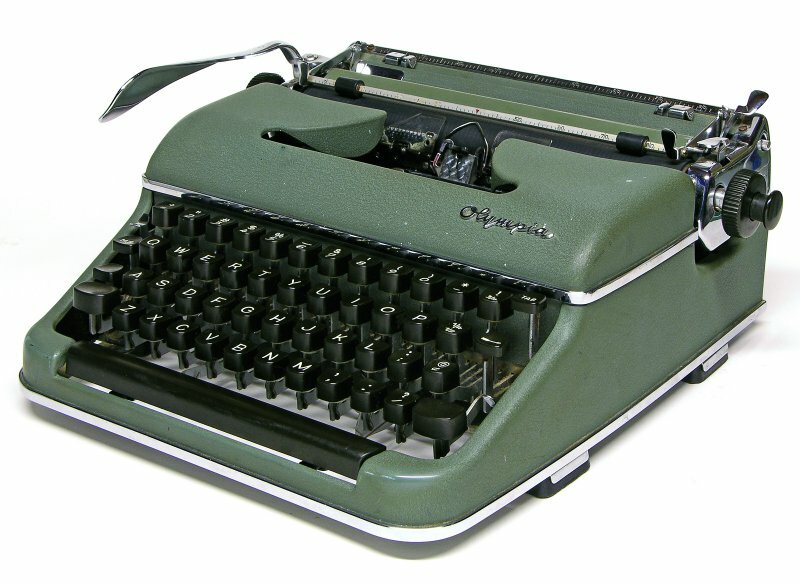 The Olympia looks well-used; it has a Swindon dealer's decal (complete with five-digit phone number), not to mention a correcting fluid stain, which has subsquently been lined with blue ball-point, presumably by a bored typist, or perhaps a novelist. This brings my typewriter "collection" to two: the other being a 1970s Olympiette, a present from my mother-in-law. My wife thinks I am mad to entertain such beasts when I already possess a PC, but sometimes it is nice to get the manual typewriter out and bash out a few lines of meaningless prose. 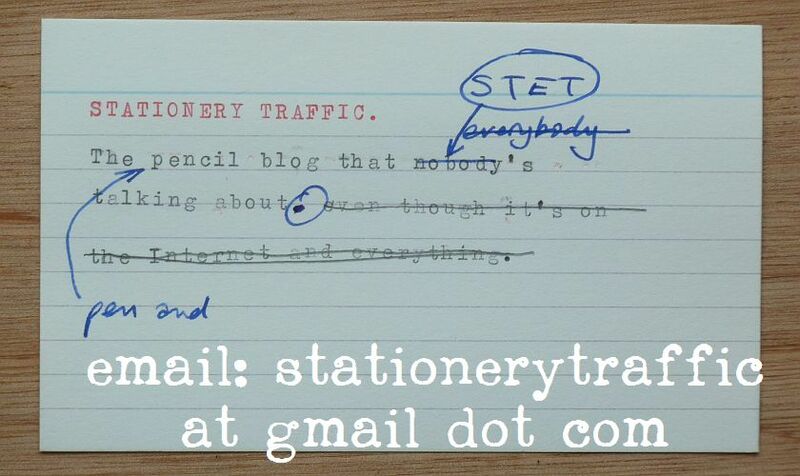 I have an idea of typing notes onto 3"x5" cards - have another look at the picture which adorns this blog. This would be useful if and when I ever get around to persuing academic research again, perhaps for a master's degree. After all, if it's good enough for the historian David Starkey, it's probably good enough for me. I use index cards a lot to write down to-do lists or just notes in general, because I don't like Post-it notes much. (The paper is crap and it doesn't take fountain pen ink at all well.) The 3"x5" card is an ideal size, I think; big enough to write quick notes on, but small enough to fit inside a diary, Filofax or book. I keep a bunch of them held together with a large clip. Obviously, a good day; and I'll be back again next year.